Earlier this month, the University of New Brunswick released a detailed assessment of the economic impact it has on this province as it carries through on its critical missions – to advance knowledge, pioneer discovery, strengthen society around us and empower students to create opportunities for themselves and others. The assessment found that UNB creates an impact on the economy of New Brunswick totalling $1.2 billion annually, or 4.5 per cent of the province’s GDP. This is a significant contribution to our province – money that flows back to our communities and to New Brunswickers. The answers are revealed in the assessment. Looking first at only the funds invested directly by government in support of our operations, taxpayers in the province paid $127.5 million to help fund our work in 2013-14, the year under study. In return, they received back more than $265 million in added taxes – more than double the initial investment. Of course, the benefits are much richer. The pursuit of higher education improves livelihoods, avoiding social and health care costs that society might otherwise see. The assessment calculates that the province saves nearly $3.5 million in social costs in a year because of UNB. 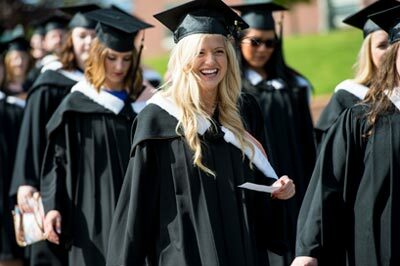 Society as a whole benefits through the contributions that our students make to workforce through their careers here in New Brunswick – indeed, the report reveals that the impact of our alumni on our province equates, in dollar terms, to almost $950 million a year. The report also shows that students more than double the investments they make in their education with us – for every dollar, they receive back $2.80 in higher future earnings. Certainly, that kind of return on investment invariably exceeds most facing students. I won’t attempt to take your readers through all of the numbers in the report, conducted for UNB by Economic Modeling Specialists International, but it is available at unb.ca/president/reports.html. At UNB, we are passionate about the role we play within the province. We know that what we do changes lives. We know, for instance, that half of the students who come to us are first in their families to attend university. We know that the Promise Partnership, a program that provides academic support to high school students who live in priority neighbourhoods in Saint John, is helping those youth stay in school and graduate on time. We know that the Community Health Clinic in downtown Fredericton, designed and run by our Faculty of Nursing, is helping to improve access and care for people otherwise without. And we know that the clinic's innovative and fiscally sustainable approach to care has led to a partnership with Horizon Health Network and is being held up by the province as a model for adoption elsewhere. We know that our innovation efforts are critical to this province – 75 per cent of all publicly funded research here is conducted by the University of New Brunswick. Our research amounts to more than $73.5 million in direct and indirect spending in a year and is essential in promoting the success of our the province. Indeed, society depends on us not only to help build New Brunswick’s economic fortunes but to help solve environmental challenges, advance health care and social development, pioneer energy alternatives and much more. It’s clear that the university and its people are part of the solution – key to the future success and prosperity of New Brunswick. One of many ways in which we seek to build the economy of the province is through our focus on teaching and nurturing entrepreneurship. We’ve been at it for decades and, last year, were recognized by Startup Canada as the nation’s most entrepreneurial post-secondary institution. Now, for us entrepreneurship is not just about business school. It’s a way of thinking that can be adopted by faculties and students of any discipline – from arts to engineering to biology. At its core, entrepreneurship is about creating opportunity – opportunity not just for oneself, but for others. This latter aspect allows us to foster the development of social enterprises aimed at building a better society in a sustainable way. The economic impact assessment tells us that our efforts at nurturing startup and spinoff companies accounted for more than $48 million in added income to the province for the year, and added more than 450 jobs. We are justifiably proud of what we do at UNB, and the valuable role we play within the province. We commissioned this assessment so that government and the citizens of New Brunswick have tangible evidence of our value to the province. The numbers do not reveal all that we are or all that we do for our students and for New Brunswick. But they do underline for those who invest in us the remarkable return they enjoy on those investments.